As a youngster in the UK I loved going to the cinema and always attended the Saturday morning children’s matinees. On getting older a different lifestyle brought different pursuits and I didn’t bother too much with the cinema until the big screen multiplex cinemas came into being and then I was hooked again. Chris also remembers as a youngster being an ABC Minor and attending Saturday morning matinees. How things have changed from those days to the present time in the world of cinema. Since living in North Cyprus for the past 13 years I had not thought of going to see a movie, although there were big screen cinemas in Lefkoşa. 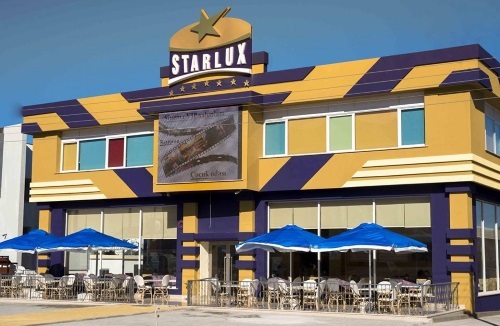 However, when the Starlux cinema opened in Karaoğlanoğlu we visited to see what it was like and were very impressed but until now I still hadn’t been to see a film. Chris receives a weekly schedule of films from the Owner/Director – Elena Kochkina and I was interested to note a film being shown – The Great Wall (Çin Seddi) starring Matt Damon. Having been to China and walked on the Great Wall I thought this is a must to see. I had no idea of the content of the film and it was not exactly what I thought it would be, however, I was not disappointed. It was a superb film in 3D (something I have not experienced for many years) and it was thrilling from start to finish. We were given 3D glasses when we arrived at the Saturn Salon and I ducked and dived in my seat practically all the way through the film as fire balls, arrows, spears and large lizard-like creatures came at me from all directions. On the subject of seats, they are very luxurious, like sitting in an armchair. For those who like to nibble while watching a film, there is popcorn, nachos with dips and a fruit packet to choose from….. The Great Wall film has been extended for a further week from 13th to 19th January and the times and Salons can be viewed below. It is well worth seeing. I am now hooked again and look forward to seeing another great movie in the near future. The Starlux Cinema is on the main road in Karaoğlanoğlu and there is plenty of parking space at the rear. There are 5 Salons showing a good range of films every week which can be viewed on cyprusscene.com and northcyprusforum.net which publishes the schedule each week. The Salons are named after Planets – Jupiter, Mars (VIP), Neptune, Pluto, and Saturn. There is a very comfortable cafe area at the entrance with an outside area for the warmer months and hot and cold snacks can be purchased, together with hot and cold drinks and a lovely selection of desserts and cakes, at reasonable prices. North Cyprus has plenty to offer in the form of recreation and entertainment and many will have already sampled cinema at its best but if you have not I would strongly recommend a couple of hours enjoying a good film in a very modern and well laid out cinema. To whet your appetite have a look at the trailer below of The Great Wall…. This entry was posted in Entertainment and tagged Cinema, Entertainment, Girne, Karaoğlanoğlu, North Cyprus, Starlux cinema, TRNC. Bookmark the permalink.